McNary drama director Dallas Myers has 44 students in his fundamentals of acting class. But that’s nothing compared to the 51 in intro to theatre last semester or his stacked technical theatre class that got so big last year that he had to sell one of his prep periods and split the class into two. Since Myers is the only theatre teacher at McNary and can only teach for six periods, stacking his classes is common. Advanced drama directing, advanced scene works and advanced theatre arts are all in the same period, as are theatre design, regular technical theatre and advanced technical theatre. Myers teaches in the Ken Collins Theatre but his intro to theatre class was even too big for the stage. Myers said fundamentals of acting is about 10 students too big. In the class, kids do a three-minute performance for their final exam, which will take five class periods to get through every student. Myers definitely isn’t the only elective teacher dealing with giant class sizes. Art classes also have more than 40 students and Mike Connor, who teaches three weight training courses, has at least 50 kids split between 12 power racks in all of his classes. While Connor wishes he could spend more time with each individual student, he’s making it work. Culinary arts teacher Wendy Bennett has up to 42 students in her food essentials class. Seven kids spread over six kitchens, each with a burner stove, oven, grill and griddle, are given rotating jobs—kitchen manager, supply manager, two assistant cooks, a dishwasher and a sanitarian. The students learn basic sanitation, measuring, how to read a recipe and how to work together as a team. The curriculum primarily focuses on baking and cooking breakfast. Bennett taught six classes her first semester of the 2015-16 school year and then seven during the second semester. The classes were so popular that McNary wanted to have eight periods this year and were able to hire a part-time teacher, Irina Bakun, to lead two sessions. “It’s exciting to have a program that the students want to be involved in and also have the support of the administration that want to grow programs that the students are interested in,” Bennett said. But now culinary arts, which also includes four upper level classes, can’t grow without an additional classroom. Myers and Connor said their departments could also benefit from another teacher. When Connor was at South Salem, weight training became so popular that the school started doubling the classes with two instructors in the weight room leading 75-80 kids. McNary is also limited to a certain amount of full-time equivalent (FTE), or available hours for employees. Jespersen was supposed to meet with the school district on Friday, Feb. 24 to receive his FTE for next school year but that meeting has twice been rescheduled. When looking at FTE, Jespersen said he hires for talent, not position. “Just because an Algebra I teacher retires, I don’t automatically say I am only looking for an Algebra I teacher,” he said. “I am looking for an Algebra I teacher but if I have an amazing art teacher, this teacher is out of this world, I would consider hiring the art teacher and then have one or two more kids in a math class and then the next year I might hire one or two math teachers. Jespersen added he thinks about hiring 365 days a year. While McNary’s average class size is 29 students and large classes have primarily been an electives problem, one of Katie Wickham’s chemistry classes had 42 students last semester in a room with only 32 desks. For safety reasons, she stopped doing labs and instead had students do work online. McNary was able to reduce the size of Wickham’s classes this semester by combining two of Frank Hanson’s smaller honors chemistry classes. The reason the classes got so big is because McNary only has two licensed chemistry teachers. 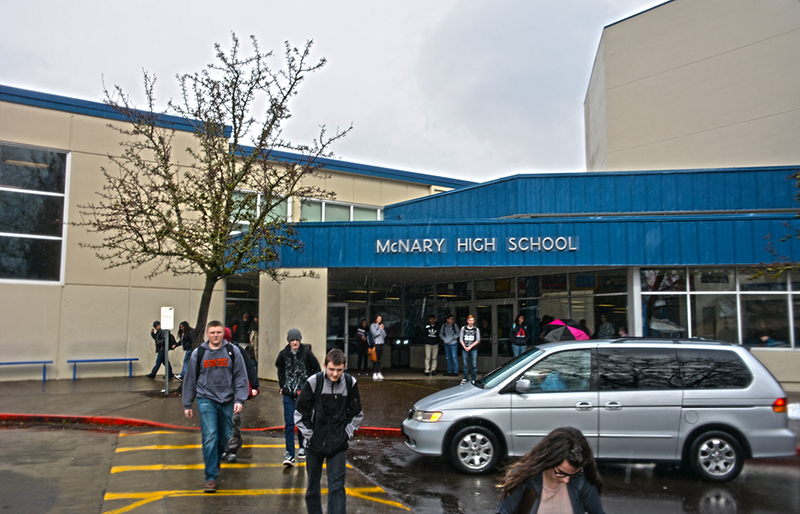 To alleviate the problem, McNary is offering more upper level science classes next year. Assistant principal Rhonda Rhodes is in charge of the master schedule at McNary, a job that got more difficult two years ago when the Salem-Keizer School District went from a seven period day to eight. The change put all the high schools on a common schedule so that students could spend time and gain the benefits of the Career and Technical Education center on Portland Road in Salem. But it also added an extra elective to all 2,100 students schedule without adding any elective teachers. Tenth, 11th and 12th graders register for the next year’s classes two weeks before spring break. After spring break, upcoming freshmen take their turn. Their assignment is to pick 16 classes, eight for each semester, as well as four alternates. Some core classes, like English, math and science are pre-determined. Rhodes then takes those requests and the school’s FTE and builds sections accordingly. Electives like weight training and culinary arts will have eight sections while some classes may only have one. Automotive classes will max out at six because there’s only one teacher, Michael Melting, and one shop. After every kid has 16 viable classes, a computer simulation places each student in their desired classes and Rhodes gets a list of kids that don’t match. Then the hand scheduling begins.